GRAFENWOEHR, Germany — Staff with the Rose Barracks Army Community Service host a volunteer town fair Sept. 21 aimed at familiarizing volunteers and potential volunteers with opportunities in Vilseck and Grafenwoehr. The event will take place at the Tower Barracks Field House, Bldg. 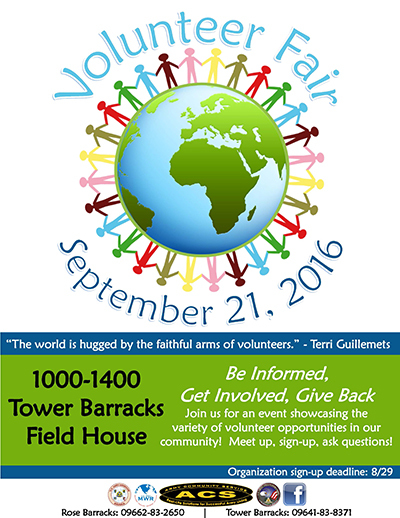 547, Sept. 21, from 10 a.m. – 2 p.m.
“The intent is to encourage and promote volunteerism across the community. Additionally, individuals will gain knowledge of the vast number of opportunities across the footprint,” said lead organizer and ACS social services program specialist, Porché Leonard. The event will be structured to connect individuals seeking volunteer opportunities with organizations that can align with those volunteers’ skills and interests. The idea for the fair was hatched when a community Army spouse brought forth the concept to garrison leadership. Ms. Leonard and her ACS colleagues have already begun identifying organizations potentially interested in having volunteers. “In addition to increasing the number of volunteers on the Rose Barracks and Tower Barracks, we want to open up opportunities for community members — Soldiers, spouses, retirees, civilians and families — looking to really use their skills or maybe even learn new ones,” Leonard said. If you have questions, call DSN 476-3639/2650, CIV 09662-83- 3639/2650.